Specialists in custom architectural and ADA signage and wayfinding systems, we offer complete services from design, specifiying and fabrication to installation. Our knowledgeable and experienced staff work with you to create signage that compliments the decorative and architectural elements of your facility. Our in house fabrication utilizing state of the art computerized manufacturing equipment allows us to complete all aspects of your project. We are proud to operate in our own production facility - 4 laser engraving and cutting systems including a 48” x 96” area for large sign panels and CNC routers with up to 52” x 100” cutting beds that enable us to provide unlimited flexibility in shapes, sizes and design elements that incorporate your logos and graphics in an unlimited choice of materials. Some of the many material options we offer include Corian and all solid surface brands, wood, acrylics, laminates, aluminum, metal laminates including Chemetal, plastic substrates, Colorcore and many other materials. We offer Dedication and Ceremonial Signs and cornerstone signs in Cast Bronze, Cast Aluminum and Magnesium as well as Corian and all cast and flat metal waterjet cut letters and logos. Some of our many clients are Hotels, Colleges & Universities, Hospitals, Hospice Care Centers, Assisted Care & Skilled Nursing Facilities, Public Buildings such as Courthouses, Elementary and Secondary Schools, Corporate & Retail Offices. We are knowledgeable in ADA standards and complete all compliant projects in house with our Braille system. 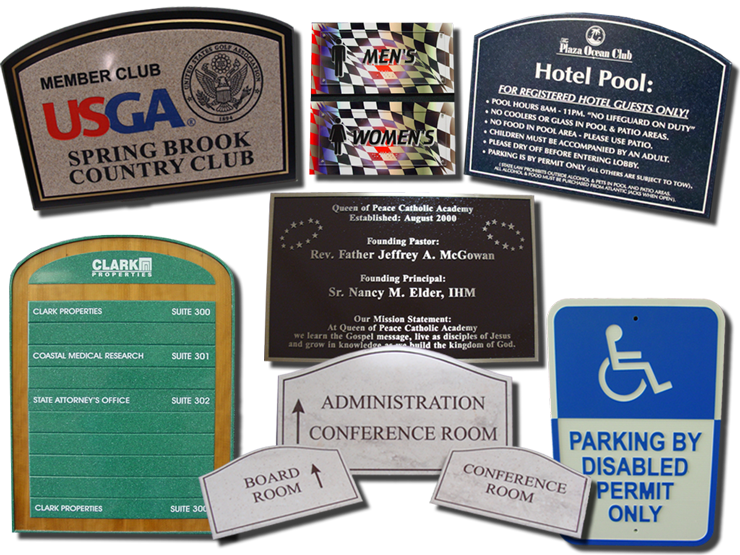 We offer all our products to the sign industry trade as blank product or complete job with no minimums required.